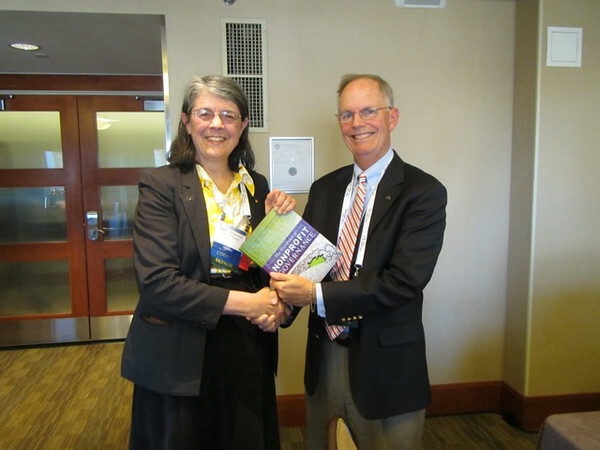 Incoming AAS Treasurer Nancy Morrison is presented a nonprofit-governance best-practices handbook by outgoing Treasurer Peter Stockman. Stockman served as Treasurer for nine years, helping to guide the Society through the transition of its journals to a new publisher and overseeing a significant increase in its net assets. Morrison is a former Councilor and a welcome addition to the current Council as Treasurer. Photo by Fritz Benedict.